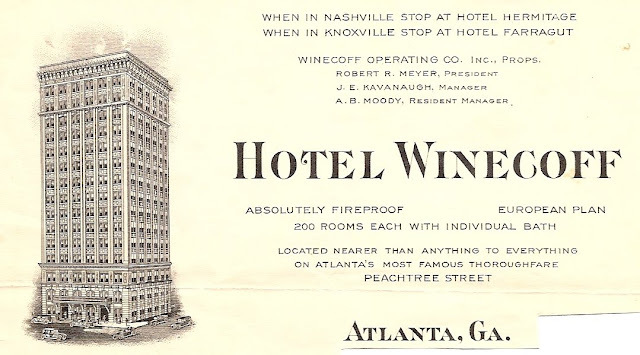 In 1946 the Winecoff Hotel in Atlanta, Georgia was the scene of a fire. 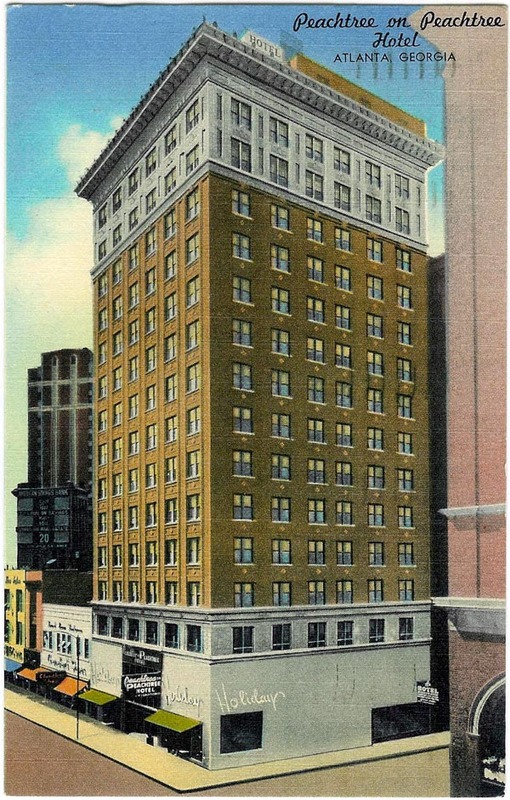 This is the site of the worst hotel fire in US history. In the predawn hours of December 7, 1946, the Winecoff Hotel fire killed 119 people. The 15 story building still stands adjacent to this marker. 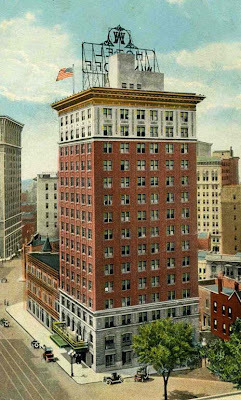 At the time, this building had neither fire escapes, fire doors, nor sprinklers. For two and a half hours, Atlanta firefighters and others from nearby towns battled valiantly in the cold to save the majority of the 280 guests. 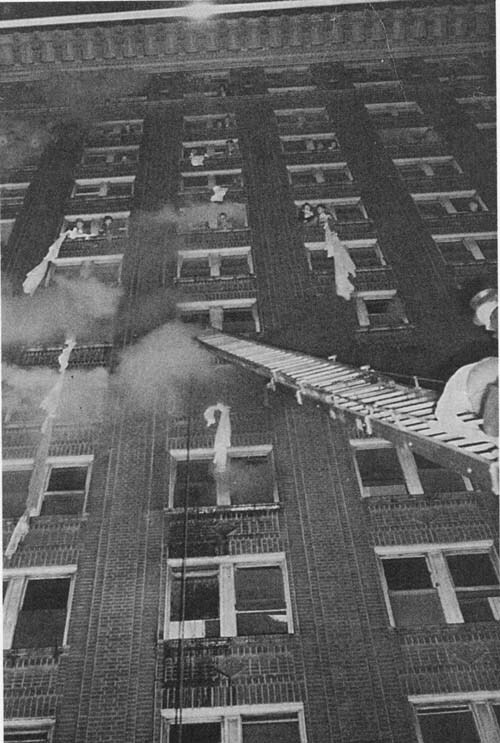 But their ladders reached only to the eighth floor, and their nets were not strong enough to withstand jumps of more than 70 feet. Therefore, numerous guests died on the sidewalks and in the alley behind the building. Thirty of the 119 victims were among Georgia’s most promising high school students, who had come to Atlanta to attend the YMCA’s Youth Assembly at the Capitol. 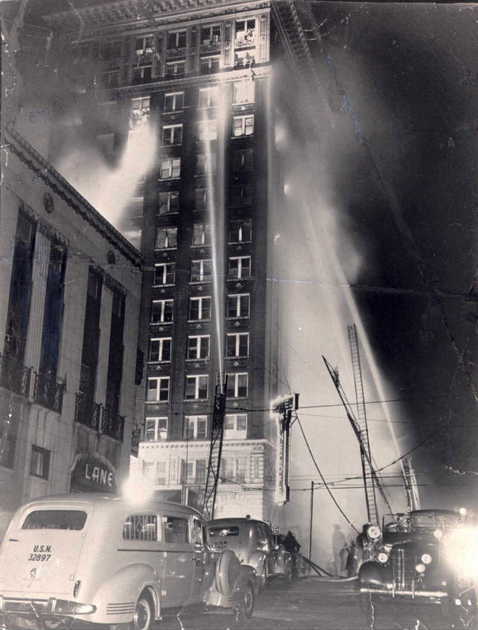 The Winecoff fire became the watershed event in fire safety. Within days, cities across America began enacting more stringent safety ordinances. The fact that the Winecoff fire remains the worst hotel fire in US history is testimony to its impact on modern fire safety codes. Among the dead were the owner, W. F. Winecoff, and his wife, found in their luxury suite on the 14th floor. It was later established that the fire had been started by an arsonist. On the night of the Winecoff Hotel fire, Arnold Hardy, a 26 year old Georgia Tech graduate student, was still up at 4.00am after taking his date home and catching the trolley back. 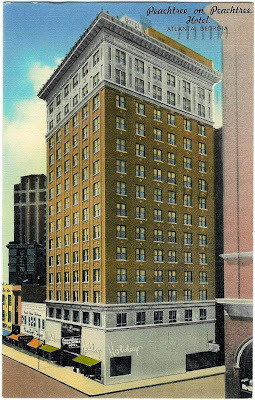 Hardy worked in the research lab and physics department of the Tech and lived in a rooming house near the hotel. He was also a keen amateur photographer. Hearing sirens, he rang the fire department and said "Press photographer. Where's the fire?" 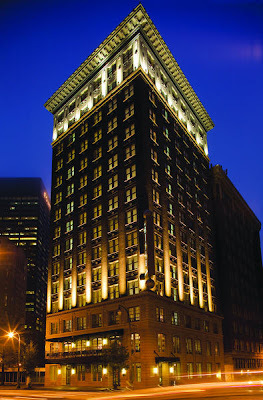 He was told "Winecoff Hotel." He caught a cab there with his Speed Graphic camera and five flashbulbs. He was the first photographer there. Guests at the hotel were jumping out of windows in panic and were falling from makeshift ropes of bedsheets. 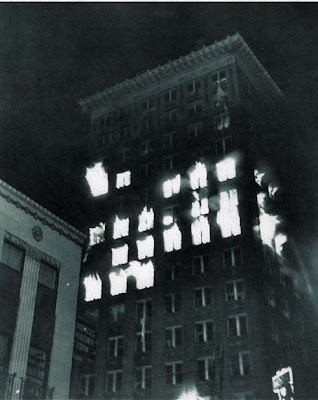 Hardy took some shots of the front of the building and the faces of the doomed in the windows and, down to his final flashbulb (one had exploded in the cold night air), Hardy decided to try for a picture of a falling or jumping guest. When his viewfinder found a dark-haired woman falling midair at the third floor, her skirt billowing, he snapped the shutter open for 1/400th of a second. With his photography completed, Hardy heard a fireman and policeman at a drugstore across the street discussing calling the store owner so they could obtain medical supplies. He told them to break the door open. When they said they wouldn't he kicked it open himself. Although he was arrested, the Red Cross moved into the store to set up a first-aid station and make sandwiches and coffee for the firemen. Hardy was led off to jail. Upon being released on his own recognizance, he headed for the darkroom at the Tech research search lab. 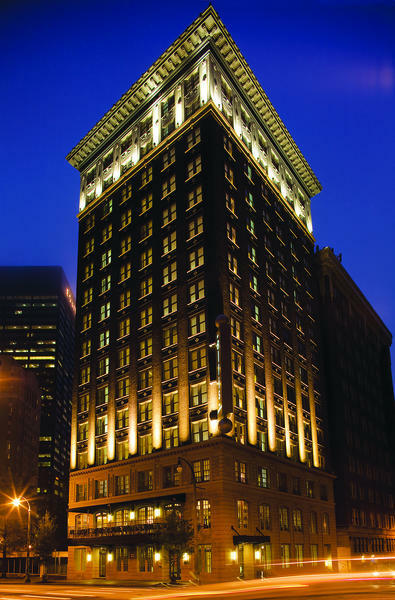 He developed his film and struck out for the Associated Press office downtown. The AP offered him $150 for exclusive rights to his pictures. He said he wanted $300 and received it. 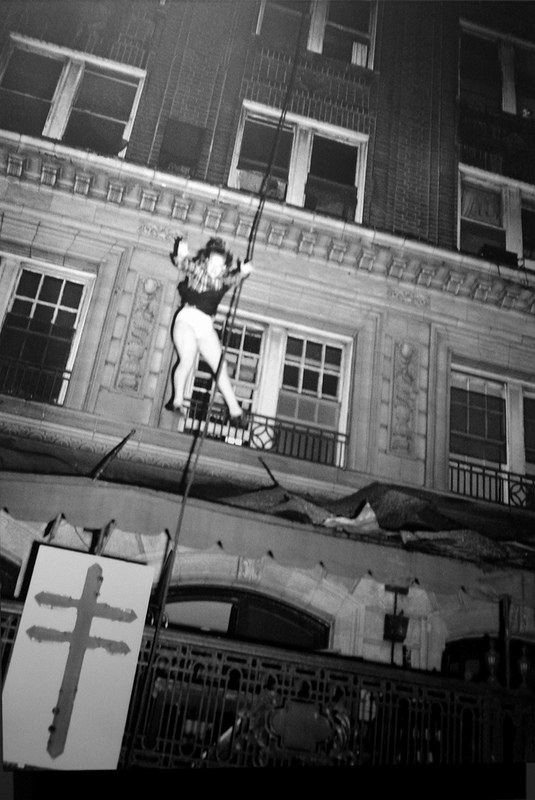 The final photograph, the one of the jumping woman, was reprinted around the world the following day and was on magazine covers for weeks. The fire had killed 119 people and drawn international coverage as the worst hotel fire in the history of the world. A few months later, Hardy became the first amateur photographer to win the Pulitzer Prize. The AP gave Hardy a $200 bonus the day after the fire, but he has never received another cent for its frequent use. 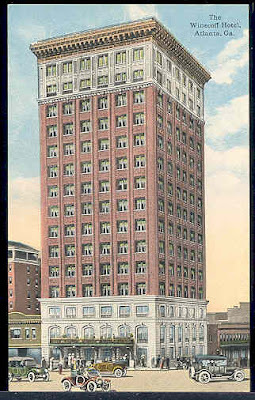 The "jumping lady" was Daisy McCumber, a 41-year-old Atlanta secretary who, contrary to countless captions, survived the 11-story jump. She broke both legs, her back, and her pelvis. She underwent seven operations rations in 10 years and lost a leg, but then worked until retirement. She died in 1992 aged 87, having never revealed even to family that she was the woman in Hardy's photo. Hardy, a mechanical engineer, retired in 1993 and sold his business of the manufacture of medical x ray equipment to his son. He retired from amateur photography decades earlier, shortly after realising his photos would always be measured against his Pulitzer Prize winner. "It upset me so much that of all those trucks--there were about 18 in the front of the building I saw only two nets. I thought to myself, 'I'd love to take a picture that would just stir up the public to where they would do something about this and equip every truck in the city with a net.'" "The trapped victims were descending ropes of blankets and bed sheets in desperate attempts to reach the fully extended ladders." (On hearing a bystander shriek) "I looked up, raising my camera. A woman was plummeting downward. As she passed the third floor, I fired, using my last flashbulb." Hardy’s photograph, the horror it depicted and its rapid, wide distribution were some of the main reasons for the rapid upgrade of fire codes nationwide. For the record, Arnold Hardy was born on 2-2-22. He was 24 years old rather than 26 years old on December 7, 1946.